Book Condition: NOT ex-library. Slight cover wear. Pages clean and the binding is tight. Includes disc in unopened rear pouch - disc not guaranteed. Comment: NOT ex-library. Slight cover wear. Pages clean and the binding is tight. Includes disc in unopened rear pouch - disc not guaranteed. 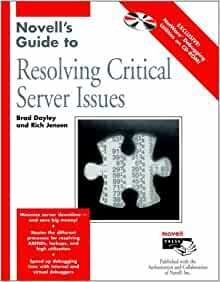 The Server Protection Kit from Alexander LAN, Inc.
About the Authors Brad Dayley and Rich Jensen, both CNEs, are software engineers on Novell's Critical Problem Resolution Team. Together, they have over 14 years of experience troubleshooting Novell products and have resolved literally thousands of critical server issues. They are the creators of the advanced debugging course used to train Novell's support engineers.